KBB.com 10 Most Awarded Brands. This Chevrolet Equinox delivers a Gas V6 3.6L/217 engine powering this Automatic transmission. ENGINE, 3.6L V6 SIDI (SPARK IGNITION DIRECT INJECTION) with VVT (Variable Valve Timing) (301 hp [224.4 kW] @ 6500 rpm, 272 lb-ft [367.2 N-m] @ 4800 rpm), Wipers, front variable-speed, intermittent with washer., Wiper, rear variable-speed, intermittent with washer. 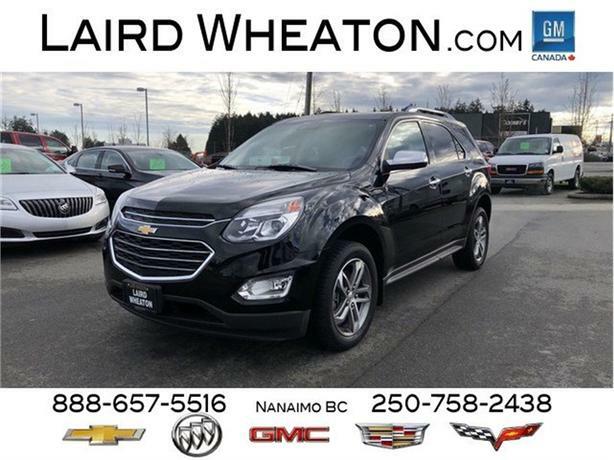 *This Chevrolet Equinox Comes Equipped with These Options *Windows, power with Express-Down on all 4 doors, Wheels, 18 (45.7 cm) aluminum, Visors, driver and front passenger illuminated vanity mirrors, Universal home remote, Traction control, Tires, P235/55R18 all-season, blackwall, Tire, compact spare with steel wheel, Tire Pressure Monitor System (Does not monitor spare. ), Theft-deterrent system, anti-theft alarm and engine immobilizer., Suspension, Refined Ride. * Stop By Today *A short visit to Laird Wheaton located at 2590 Bowen Road, Nanaimo, BC V9T 3L3 can get you a tried-and-true Equinox today!